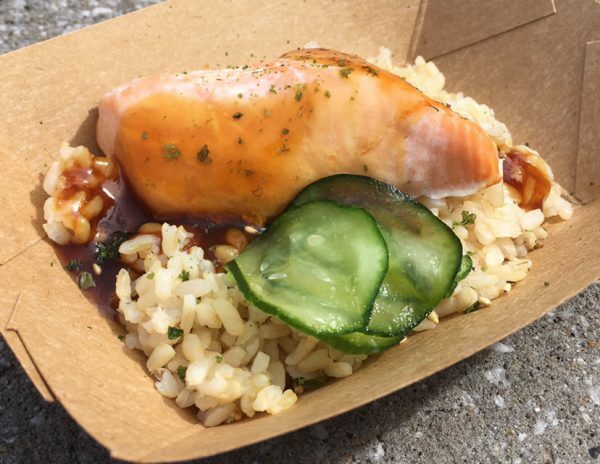 “Food” & Garden ’18 Flash Report: Teriyaki Salmon – Hanami (Japan) | It's "All in WDW"
Let’s continue “our” journey through 2018’s “Food” & Garden festival on a high note, shall we? Japan’s Teriyaki Salmon was outstanding! Honestly, if I have anything critical to say it is that the portion size was way too small. As well as the dish was prepared, and as tasty as the Teriyaki Sauce melded with the rice and fish, I would have loved a full-size entrée! Great job, Hanami!